Our next tattooed poet is Teresa Mei Chuc, who has had all of her tattoos done at Shogun Tattoo in Pasadena, California by Andrew Moore. 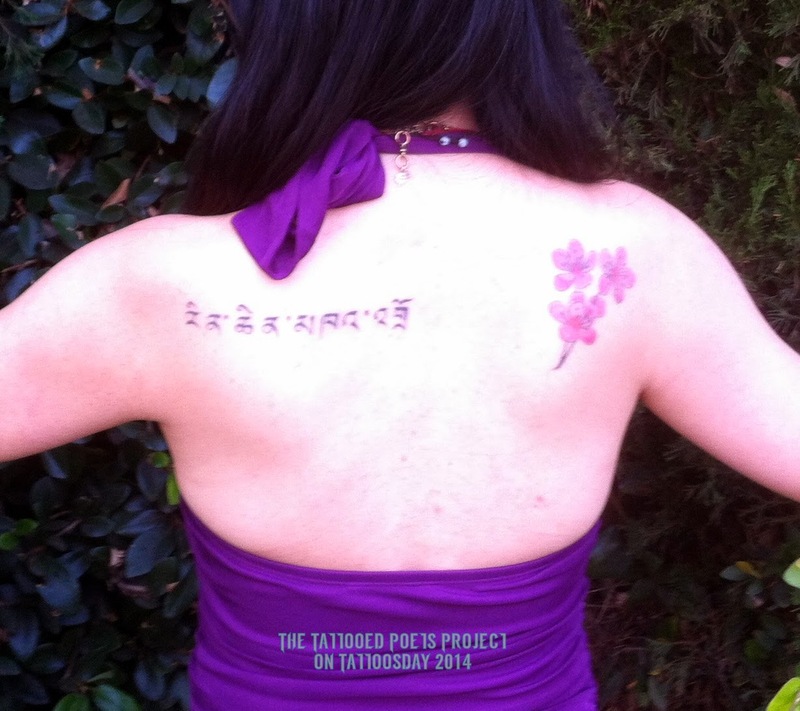 "My first tattoo, in Tibetan script, is my dharma name, Rinchen Khandro, which means 'precious dakini or sky dancer' in Tibetan. The name was given to me by Wangchen Rinpoche of the Maha Vajra Center in Los Angeles during my Buddhist refuge ceremony. The name means a lot to me because it embodies my spirit and purpose in life...dancing in the sky has a deep metaphorical meaning to me. The sky also represents sunyata. I wanted it tattooed because I wanted to always remember it among all my other names (Vietnamese - Tue, Cantonese - Mei Wai, American - Teresa). The other tattoo on my back is cherry blossoms. I found out recently through a mitochondrial DNA test that I was part Japanese and the cherry blossoms represent that part of myself. I had known that I was part Vietnamese and part Chinese; my Japanese lineage came as a surprise and I wanted to embrace that part of me and the history that is interwoven with it." 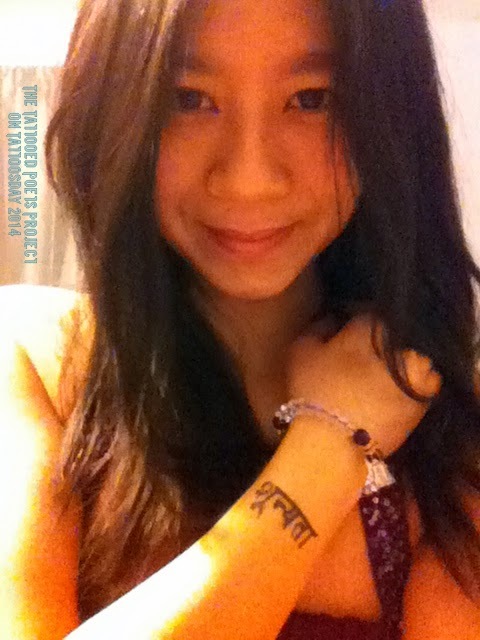 "The tattoo on my wrist is the word 'sunyata' in Sanskrit. Sunyata means emptiness, nothingness, openness. It is an important concept to me and a very important concept in Buddhism." 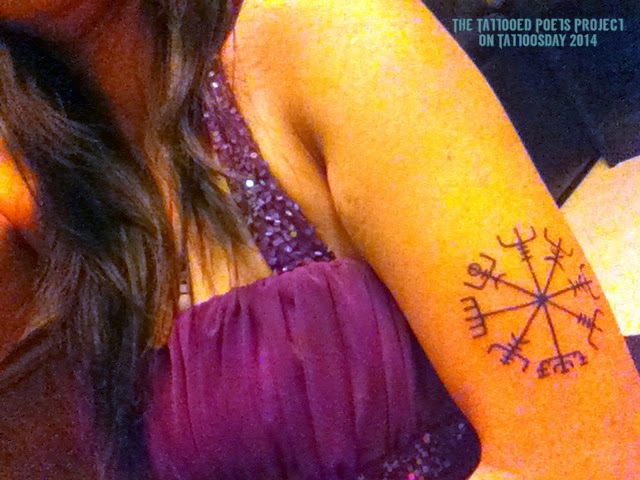 "The tattoo on my upper arm is a Vegvisir, a Norse protection symbol. 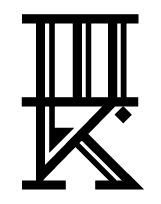 It is a Runic compass and a symbol from the 17th century Icelandic grimoire called Galdrabok ('magic book'). I tend to get lost, so I hope this built-in compass will keep me from getting lost." 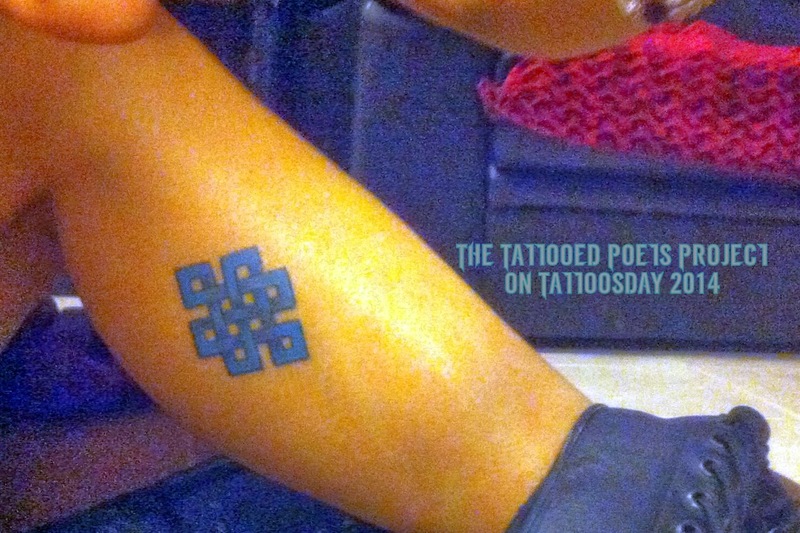 "On my leg is an endless or eternal knot, an important Buddhist symbol representing the interweaving of the spiritual path, the flowing of time and movement within that which is eternal. I find these days, it is easier and easier to forget the important things and my tattoos help me to remember." and I will go on with my drawing." all were annihilated by the same weapon. Above, drones - silent, unmanned planes. the color and length of a mustache. contemplates, then pushes a button. where the girl once stood. as the desert sky, blank as the smooth shell of a drone. the glass touches his mustache. A silent bird hovers above. splattered organs among broken concrete. Soon, there will be no trace. Teresa Mei Chuc was born in Saigon, Vietnam and immigrated to the U.S. under political asylum with her mother and brother shortly after the Vietnam War. Her poetry appears in journals such as EarthSpeak Magazine, Hypothetical Review, Hawai’i Pacific Review, Kyoto Journal, The Prose-Poem Project, The National Poetry Review, Rattle, Verse Daily and in anthologies such as New Poets of the American West (Many Voices Press, 2010), With Our Eyes Open: Poems of the New American Century (West End Press, 2014), and Mo’ Joe (Beatlick Press, 2014). Red Thread is her first full-length collection of poetry. Her second collection of poetry was just accepted for publication by FootHills Publishing and is forthcoming in 2014! Visit her at www.tue-wai.com. 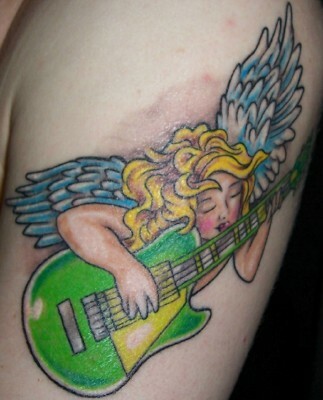 Thanks to Teresa for contributing to the Tattooed Poets Project on Tattoosday!